Choose - Generation, GB Size, Color! 45 Day Guarantee! Apple iPod Touch 5th Generation 64 GB - Excellent Condition. MONEY BACK GUARANTEE ! FREE SHIPPING WITH ACCESSORIES ! Condition is Used. Fully functioning condition. Trending at $119.99eBay determines this price through a machine learned model of the product's sale prices within the last 90 days. Make every shot your best with advanced optics, tap to focus, and LED flash. And shoot video in 1080p HD. iPod touch loop. You’ll see it all — except the pixels. 6-mm ultrathin design. Apple iPod touch 5th Generation Red (32GB)Includes 30 day warranty. iPod has been tested and is fully functional. The front has a few light scratches. The back has light scratches. Comes with generic USB cable and headphones. For further condition details, please see pictures above. Case included and fully restarted iPod. This iPod has been wiped clean, tested, and is in working condition. This iPod shows signs of wear. Battery life has not been tested. 4.5 out of 5 stars - Apple iPod touch 64GB Space Gray 5th Generation dual cameras. 36 product ratings36 product ratings - Apple iPod touch 64GB Space Gray 5th Generation dual cameras. Apple iPod touch 5th Generation Space Gray (64 GB). Condition is Used. Shipped with USPS First Class Package. iPod is like new in perfect condition with no scratches or dings. Includes new headphones and charger and screen protectors and cases. ALL COLORS 5% OFF + FREE SHIPPING!! 3 DAYS ONLY! Like new iPod touch 5th gen 64GB. Has always had a case and screen protector on it. original box. Apple iPod touch 5th Generation Blue (64 GB) Includes 30 day warranty. iPod has been tested and is fully functional. The front has a few light scratches. The back has light scratches. Comes with generic USB cable and headphones. For further condition details, please see pictures above. B0556 CCQMT05VF4Y6 JA. Red Apple iPod Touch 5th Generation 64GB A1421. Apple iPhones. Broken Apple iPhones. Device is in 100% WORKING condition. It has been extensively tested and found to be fully functional. Unit Only. Nothing else included. Tested and Works Great. Units are A condition. READ DESCRIPTION. Facetime and iMessage can not be used! Apple iPod touch 5th Generation Black (64 GB) Includes 30 day warranty. iPod has been tested and is fully functional. The front has a few light scratches. The back has light scratches. Comes with generic USB cable and headphones. For further condition details, please see pictures above. Apple iPod touch 5th Generation Pink (64 GB) - Great Condition! Great condition. The condition of the screen and back are excellent with the exception of the case around the lightning port. There are a bunch of scratches around the port that I have highlighted in the last two pictures. 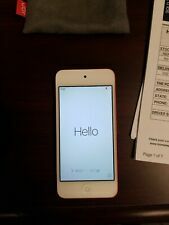 4.5 out of 5 stars - Apple iPod touch 5th Generation Pink (64 GB) - Great Condition! 25 product ratings25 product ratings - Apple iPod touch 5th Generation Pink (64 GB) - Great Condition! This iPod is preowned and in great condition and has been tested and works great. What is the history of the item?. We test them and picture their current condition. Unpaid cases will automatically be open. IPod Touch 5th Gen - 64GB - Black & Slate - Preowned -. The iPod Touch is used, in working condition. iPod Touch. Previous user data has been deleted from these devices and they have been reset to factory defaults. Used but taken very good care . Tiny scratches on screen. Comes with brand new usb cord power supply and earbuds. No damage other than the screen having the light scratches. Very good shape. Apple stickers included also. Includes: iPod only. We would like the opportunity to resolve any issues. Ipod shows signs of wear but works great. Trending at $169.00eBay determines this price through a machine learned model of the product's sale prices within the last 90 days. Apple iPod touch 5th Generation Space Gray (64 GB). Condition is Used. Shipped with USPS First Class Package. MONEY BACK GUARANTEE! | FREE RETURNS| FREE SHIPPING! Silver Apple iPod Touch 5th Generation 64GB A1421 MP3 Player. B1241 CCQJQ47LF4K2 JA. MP3 Players. Apple iPhones. Broken Apple iPhones. Color is Silver. Get Supersized Images & Free Image Hosting. Certain phones will require a sim card or an existing smartphone data plan. IPod has passed extensive testing (touch screen, wifi, microphone, bluetooth, speakers, ports, etc) and is fully functional. Works great! If You experience problems with your purchase please contact me before opening a case. Apple iPod touch 5th Generation Silver (64 GB) Fully Functional. Overall a nice looking device. iPod and off market sync cable.